We believe that a holistic view of the entire print workflow, from end-to-end, is necessary to address today’s challenges, even if you aren’t using our storefront. PressWise is an end-to-end print management information system, from estimating and order entry through to shipping and fulfillment, with integrated web storefronts and a powerful MIS providing you with all the information and automation you need to run your shop as efficiently as possible. But it doesn’t end there. PressWise APIs make it easy to integrate most third party applications, or even custom-written software, into your PressWise workflow. PressWise provides a unique mapping tool, which allows custom XML files to be automatically injected into the PressWise XML. The tool was designed to give you greater control over custom integration projects, without the need for dedicated programming resources. 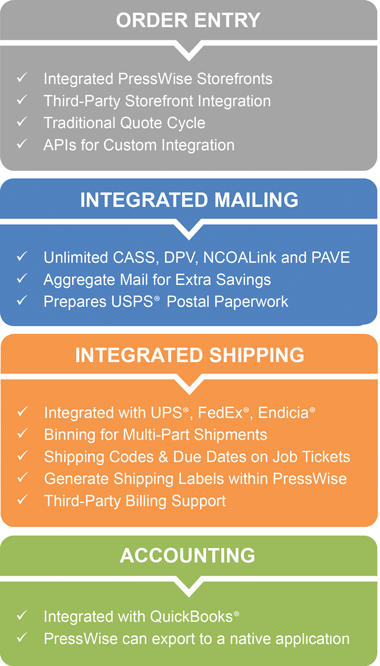 Integration projects that used to take weeks can now be done in days or even hours, enabling new streams of orders to be rapidly connected to the PressWise manufacturing center. Whether you want to import orders from other web storefront systems, send barcoded job information to your finishing department, or export financial information to your accounting system, PressWise is designed to simplify that process.